Today, I will be talking with the producer of the Resident Evil series1 - Kawata-san from Capcom.2 Kawata-san, thank you for coming. 1Resident Evil series: The first game in this survival horror series was first released in March 1996. Known as the Biohazard series in Japan. 2Capcom Co., Ltd.: A video game developer. Headquarters: Osaka. Whew, I’m nervous! (laughs) Thank you for inviting me. The pleasure is mine. (laughs) I’m looking forward to our discussion. May I start by asking what games you are making for the Nintendo 3DS system? Sure. Right now, we’re developing Resident Evil: Revelations3 and Resident Evil: The Mercenaries 3D.4 At Capcom, we like to say we’re “zessan kaihatsuchu”, or, developing to much acclaim. (laughs) 3Resident Evil: Revelations: A survival horror game currently in development for the Nintendo 3DS system. Known as Biohazard: Revelations in Japan. 4Resident Evil: The Mercenaries 3D: A survival action game for the Nintendo 3DS system. Known as Biohazard: The Mercenaries 3D in Japan. Scheduled for release on June 2, 2011 in Japan and on July 1, 2011 in Europe. I imagine a lot of fans are excited to hear that there are two upcoming titles for the Resident Evil series. I’ve heard that you have a history of making games for home consoles. What was that like? The evolution of what video games could express was intense. I was originally a designer, so I was interested in the progress of video game graphics. And a wide variety of techniques for portraying game content appeared. I was originally interested in games that featured cute characters - like the Mega Man Legends series5 - but I also had an attachment to the horror genre. Recently, I’ve been involved in development for home console games such as Resident Evil 4: Wii Edition6 and the Chronicles series.7 5Mega Man Legends series: A series in the Mega Man franchise. Known as the Rockman Dash series in Japan, where the first game was released in 1997. 6Resident Evil 4: Wii Edition: A survival horror game released for the Wii console in May 2007 in Japan. Known as Biohazard 4: Wii Edition in Japan. 7Resident Evil: The Umbrella Chronicles and Resident Evil: The Darkside Chronicles: Gun shooting games for use with the Wii Zapper and released for the Wii console. In Japan, they were released as Biohazard: The Umbrella Chronicles in November 2007 and Biohazard: The Darkside Chronicles January 2010, respectively. You were involved with the Resident Evil games that (Shinji) Mikami-san8 developed for the Nintendo GameCube console, right? 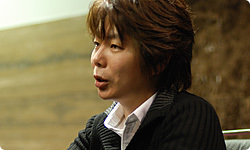 8Shinji Mikami: A former game designer at Capcom Co., Ltd. 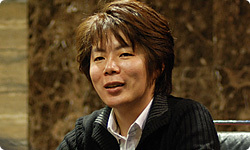 The creator of Resident Evil (known as Biohazard in Japan). I was only directly involved with the first Resident Evil for the Nintendo GameCube.9 I wasn’t part of the immediate staff that worked on Resident Evil Zero10 and Resident Evil 4.11 When we remade Resident Evil for the Nintendo GameCube, I was a designer making backgrounds. 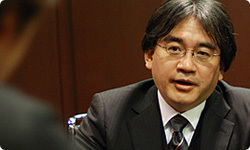 (Shigeru) Miyamoto-san would come visit the development department, so I really felt like I was working with Nintendo. I wanted to achieve the utmost possible with the Nintendo GameCube, so I really took the graphics to the extreme. It was challenging, but I think I was able to establish the Resident Evil style. 9Resident Evil for the Nintendo GameCube console: A survival horror game for the Nintendo GameCube console. This was the first Resident Evil game released for the console. Released as Biohazard in March 2002 in Japan. 10Resident Evil Zero: A game released for the Nintendo GameCube console. Released as Biohazard Zero in November 2002 in Japan. 11Resident Evil 4: A game released for the Nintendo GameCube console. Released as Biohazard 4 in January 2005 in Japan. The first time I saw Resident Evil, I was surprised at how much had become possible with home gaming consoles. It really stood out. At the time, our keyword was “raw.” We cooked up whatever we could to make the games raw as opposed to photorealistic. How do you make a game feel raw? I guess it isn’t enough to make it realistic? I think rawness starts to come out when the player’s actions have some kind of result and there’s a feeling of inhabiting an actual place with a certain atmosphere. Back then, game characters moved on an unmoving background. I felt like with the Nintendo GameCube version you were looking to see how the gameworld would change if you moved the background a lot. That’s right. In particular, the animated parts draw your eyes. As a way of making it raw, I think we did a good job of using horror elements like flickering lights and subtle movement by enemies. As I see it, whether it looks “artificial” or feels “raw” are critically important questions when you express fear in video games, questions that have continued to shape the series since the first Resident Evil. Oh, you have them imagine the players actually playing what they’re making. That generates a positive pressure that draws out their potential. Right. If, based on past experience, you just say, “This is what I’m capable of, so I’ll just do that,” in this day and age, people will see right through it. They won’t feel like you’ve really done your best. Doing your best doesn’t mean staying within your capabilities. It means going even further. You must push beyond your boundaries. And once you do that, you can aim even higher. I think that is very important. This time, I wanted to make Resident Evil: Revelations for the Nintendo 3DS system as if making a game for a home console rather than for a handheld. I was determined to see if I could base it on the high specs of home consoles rather than the specs of handhelds. Is that how you thought about it from the start? Yes. Otherwise, I didn’t think we would achieve the kind of quality we consider to be part of the Resident Evil brand. It was hard, but at the moment, I feel like we’ve done a decent job of reaching what we first intended. When the developers at Nintendo first saw Resident Evil: Revelations, they were surprised. You hadn’t made it as if for a handheld, so it clearly looked different. At present, we’re aiming even higher, so I feel like we’re pressing the boundaries of the Nintendo 3DS system. In any case, the impact of glasses-free 3D alone is big. The way the character named Jill moves is incredibly captivating. She looks even more captivating in 3D? That contrast is a part of the gameworld. Yes. The Resident Evil series places a lot of emphasis on the contrast between light and dark. When it comes to light and shadow in portraying a scary world, wondering whether something will come lunging out of a shadow is thrilling. So when it comes to contrast as a keyword, the design of Resident Evil doesn’t just feature light and shadow, but also beautiful characters and ugly enemies!